This Thursday, a football match for the ages will take place on the Wolverhampton-Staffordshire border which promises to provide memories for decades to come, like Balboa vs Creed, Borg vs McEnroe and Stone Cold Steve Austin vs the Rock. For on that evening, as the clock ticks to 7.45pm, a clan of West Midlands non-league football managers and coaches will commence battle on the hallowed turf of Wolverhampton Casuals FC against a motley crew of local referees. The referees will play under the banner of the brilliant fundraising charity The Whistle Foundation. Now, anyone who has ever been to a non-league match in these ends will appreciate the unique dynamic between officials and the technical areas. Some would say it’s a love-hate relationship. The officials love themselves. And everyone else hates them. The manager’s squad will be led by the effervescent Cassies manager Dean Gill and includes Khalsa’s very own Ian Rowe, Ross Miller and Rich ‘Benidorm’ Upton, three men who, when they were players, used to pay for the referee’s Christmas parties with their fines money. Other managers dusting off their boots will be Alvechurch angry young man Ian Long, non-league goal scoring legend Mark Swann and goalkeeping icon Dale Belford (see full squads below). Of course, such a match – riddled with grudges and bearing in mind most of the managers couldn’t tackle for toffee when they played – will require some heavyweight officiating, which is why TV’s own Steve Martin (no, not the comedian, but he’s been accused of being a joke) will be taking control of proceedings. And everyone will be keeping a close eye to see if he favours his mates on the 50-50s. 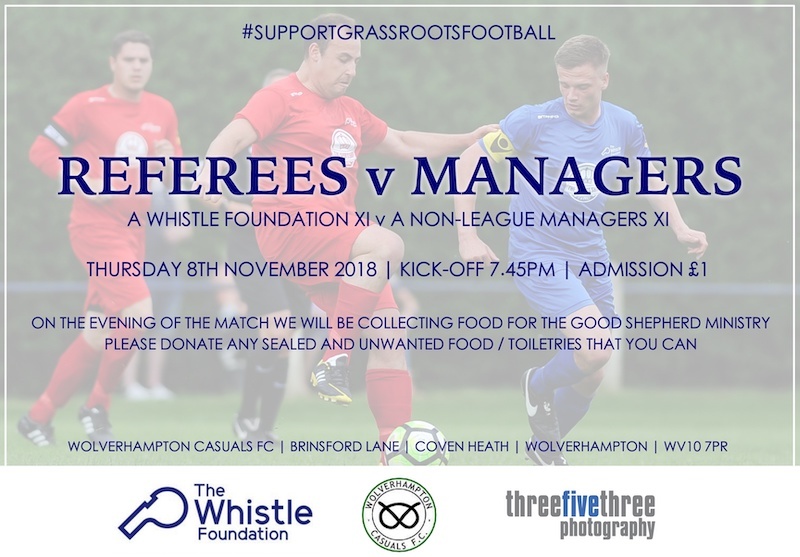 All proceeds from the match will go to the Good Shepherd Ministry who do fantastic work to feed and clothe people in Wolverhampton. Admission is £1 but please – and this is key – also bring any food and toiletry donations. They’re particularly looking for biscuits, tinned fruit, pasta, shampoo and body wash, wet wipes and toothbrushes. Wolverhampton Casuals play at Brinsford Lane. It’s a great venue, the surface is alway immaculate, the bar is brilliant and it should be a great game. Full manager’s squad: Ian Long, Rich Colwell (Alvechurch), Wayne Spicer (Black Country Rangers), Scott Hamilton (Bilston Town), Andy Parkes, Scott Moore, Mark Swann, John Reeves (Darlaston), Gary Drake (Dunkirk), Matt Clark (Halesowen), Darren Pearson (Old Wulfrunians), Jason Lanns (Paget Rangers), Paul Smith (Redditch), Dale Belford (Romulus), Mark Simpson (Shifnal Town), Ian Rowe, Ross Miller, Rich Upton (Khalsa), Quentin Townsend (Stourport), Neil Tooth (Sutton Coldfield), Danny Carter and Steve Hill (Wednesfield). Whistle Foundation squad: Ajay Sharma, Ben Stott, Brandon Scaife, Alex Rolfe, James Lunn, Jamie Howe, Carl Clinton, Niall Smith, Lewis Mountain, Matthew Bond, Ben Watkiss, Todd Ferrier, Liam Corbett, Ade Hall, Dean Steatham.